I know, right? Pretty awful. Dusty rose formica countertops, sagging particle board cabinets, inset corner sink, past-its-prime Magic Chef range – too many problems for a quick cosmetic fix. So we planned and saved for a major redo, as described in this “Before and After” story on The Kitchn. We think it was worth the wait. By the way, the honed Calcutta Gold marble (pictured above) is a dream to work on, and no – it doesn’t stain like everyone says it does. After three years of heavy use, ours is still stain-free. Etching is another story, however. The calcium in marble reacts instantly with acids like lemon juice and vinegar, and no amount of sealing will prevent it. Since I’m not about to give up lemon juice or vinegar, we’re just embracing the “patina” of etch spots that develop over time. Here’s a closer look at some of the custom kitchen features we incorporated during the renovation, as well as a peek at the temporary kitchen that our contractor (Wexford Custom Renovations) set up in our dining room. Our master cabinetmaker, Darren Edsall, handled every creative challenge I threw at him. 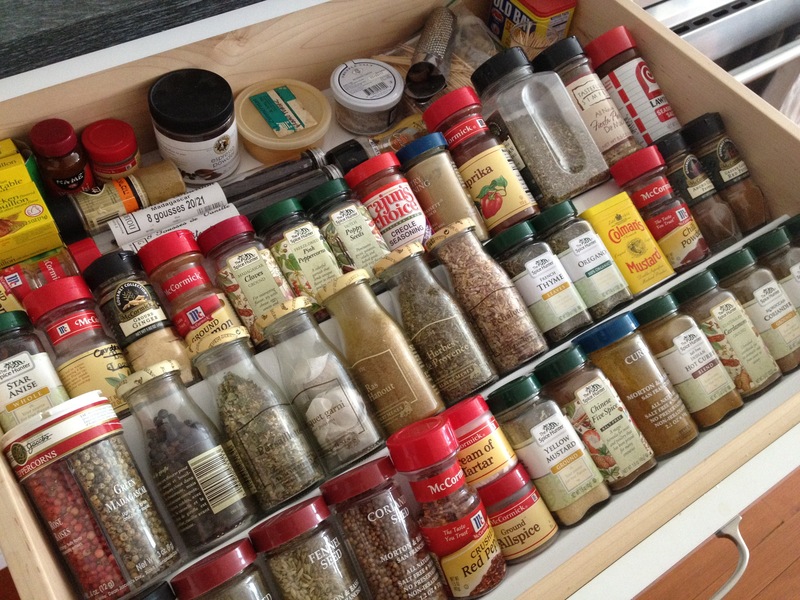 In the running for #1 favorite kitchen feature: the big spice drawer right next to the range. I love seeing everything at once. 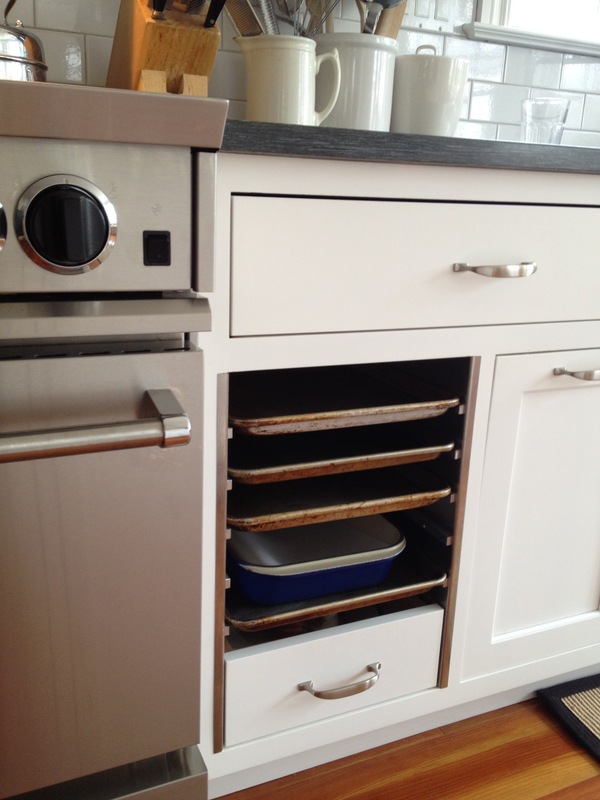 One of Darren’s creations: a built-in baking sheet rack, for storing sheet pans. When I’m baking a lot of cookies or appetizers for a party, I can stage the loaded trays here. Plus, it gives a bit of that “professional kitchen” look I was going for. 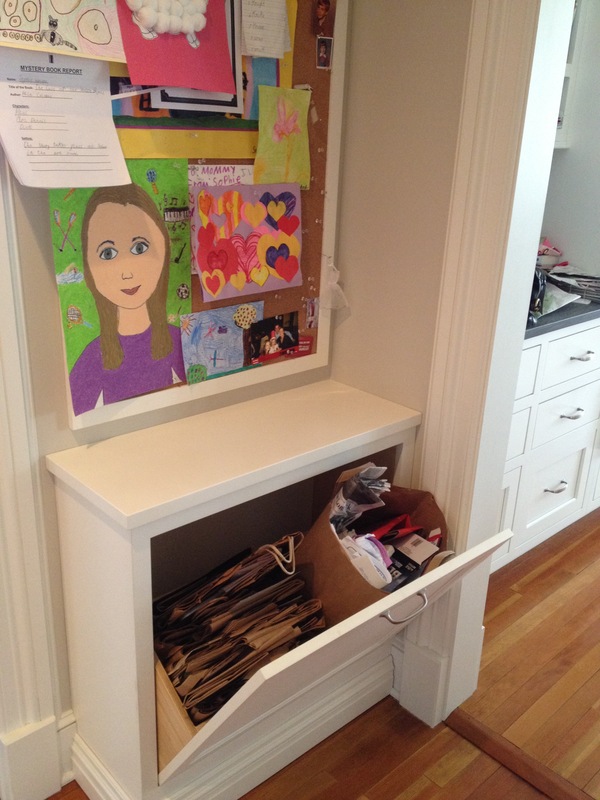 Paper recycling station (just outside the kitchen). Now you see it . . . Same trick for the printer. It’s nice to have it near “homework central”, but out of sight when not needed. WiFi printer rolls out of sight when not in use. The old island worked better as base cabinets! Believe it or not, that temporary kitchen got quite a workout. Every Thursday was Baking Day – anyone on the job site that day would be rewarded with fresh-baked muffins, cookies and chocolate buns. Needless to say, we got a lot of work done on Thursdays! 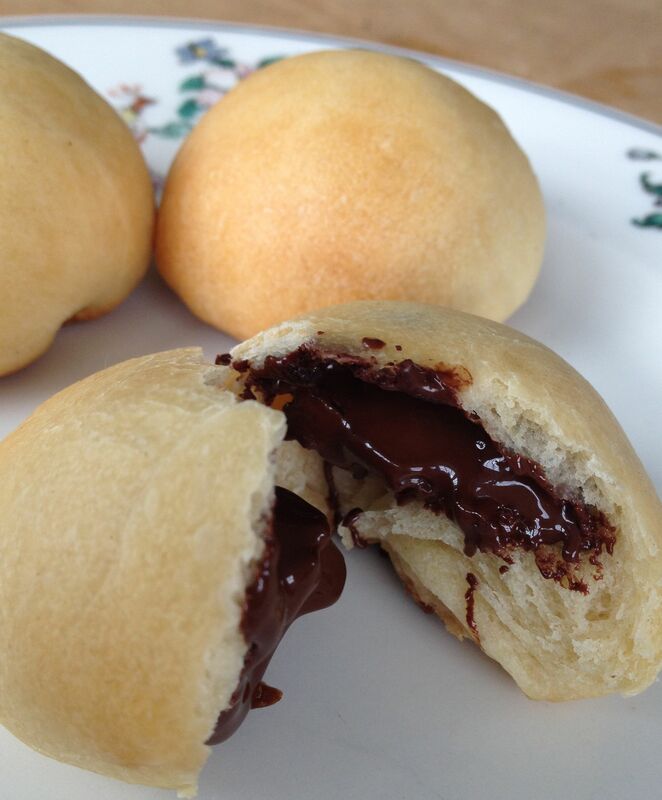 Chocolate buns – best eaten hot from the oven. Revised 10/2017 — We had to move in 2014. Pop over here to see the latest kitchen renovation. This entry was posted in Kitchen Design and tagged kitchen design, marble counters, white kitchens by subeeskitchen. Bookmark the permalink. Gorgeous! I wish I could have a kitchen like that…I can dream, right? I wonder what the rest of your house looks like:) Thanks for sharing. Love the gold honed calcutta marble. Looks as though you have a darker stone counter top as well. What would that one be? The kitchen is beautiful. The perimeter countertops are honed Pietra di Cardoso. 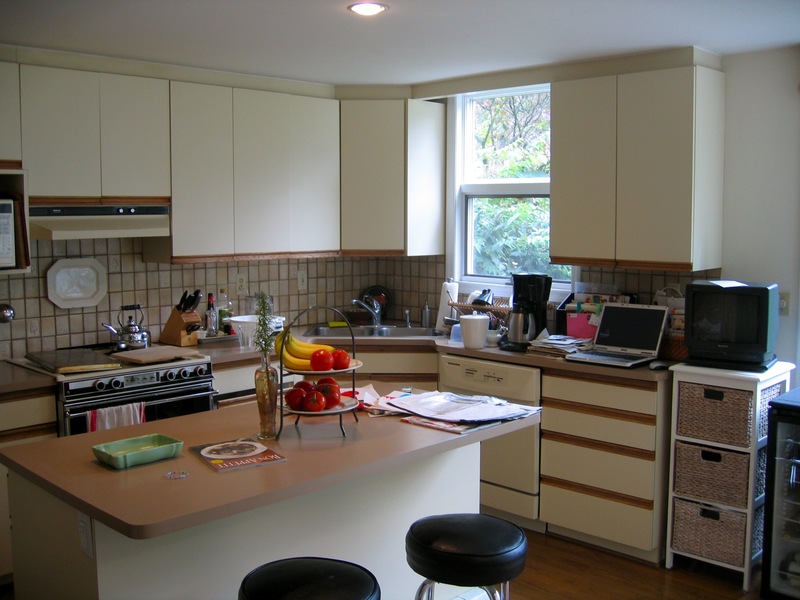 I am a huge Houzz fan and have your kitchen photos in my ideabook. We are remodeling now and my hope is our kitchen looks as bright and “homey” as yours. Well done! Now if only my cooking and baking will become like yours as well. Love the kitchen and did see it in Houzz…..my favourite! We had the same cabinetry in our house but as our is quite contemporary we didn’t put in the beautiful trim/woodwork. Never too late though I thinking! There’s always something to improve/spend money on! Wow, so we are in the planning stage of remodeling are kitchen. So many decisions!! I love yours from top to bottom! 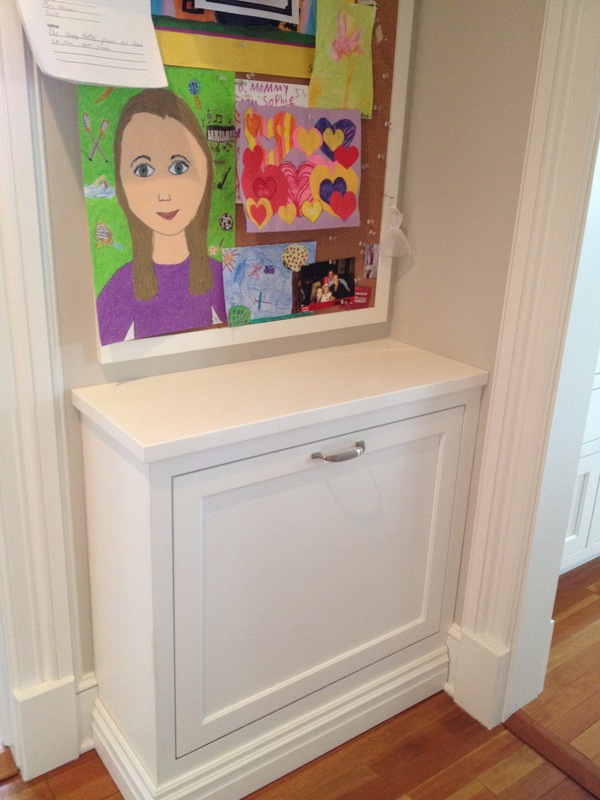 Thanks so much for sharing your pictures and storage ideas. The tips on the marble are also helpful, I have been warned about stains and I can sometimes be messy when cooking! Now as for the soap stone I was told it scratches easily. Is that true? Your daughter is super cute! We don’t have kids yet, but I’m always looking for materials that are kid friendly and durable. Thanks, Kelly – It’s fun to have admirers! Good luck with your kitchen project. As for our gray perimeter countertops, they’re not soapstone but a stone called “pietra di Cardoso” (AKA pietra cardoza/cardoso). It’s a unique stone that’s kind of like a cross between slate and marble (?) We don’t have any scratches yet, but it is soft-ish and there are a few small dings around the large sink (from heavy pots & pans, most likely). Like the marble island top, however, I love the look and feel of the pietra so much that I don’t mind a few nicks and imperfections here and there. Sue! Everything looks fabulous. Good Luck. I will keep you updated on Museum tent. Scheduled for 3/30-4/7. Come visit! I love your kitchen! Which company did you use for your ref., range, dishwasher etc? Any wishes or regrets? Just came across your beautiful kitchen. We remodeled our kitchen 5 years ago and after seeing your picture, I’d like to do it again! We added space and couldn’t figure out what to do with the outside wall. Our architect put a double door and window on the wall, nothing terribly creative. Our sink and part of the cabinetry is under the window. Would have much preferred the breakfast nook space. It would have solved my current problem of where to put our table. I either put it in a space that feels like a hallway (and no one sits there!). Or, I keep it in front of the big door during the cold months. Next time!!!! Thanks for posting your photo. It is lovely! Thanks, Laura. FYI, I have a “next time” list too! There’s always something to learn with the design process. In the meantime, maybe you could cozy up the “hallway” space with an interesting pendant light over the table or some extra-comfy “coffee shop” armchairs? Great idea! I might try the armchairs. Your “before” pictures give me hope to reimagine the space I have. Now you’ve piqued my curiosity – what is on your “next time” list?? I love your kitchen! Welcome, Diana! Make yourself at home. Hi! I am a new follower. Found you by your kitchen photos on Houzz. Your kitchen is stunning. I have been looking for design inspiration for our dated, tiny kitchen for a long time and now I have found what I was looking for!! Thank you for sharing!! Glad I found your site! Will also be checking out your great recipies! Hi, I love your kitchen and I am “copying” it as much as possible in my upcoming kitchen remodel in 3 weeks. Do you happen to remember what size pendants those are? They come in s/m/l. I am so excited. Hi – Thanks! The pendants are 15″ in diameter. Good luck! I absolutely love this kitchen! I thought I’d seen it before on Houzz and now I know I wasn’t dreaming. Hi! Great kitchen and website! Do you have a family room attached to this? Any photos of that? We are remodeling too but not sure about size and flow of rooms. It’s kitchen – from houzz I think is 19 by 26 – right? Does that include the seating area? Thanks!! Is anything in the Kirchen from Ikea? Is anything in the Kitchen from Ikea? Just 2 pillows on the window bench. Beautiful kitchen! Wow ! How much did u spend building that island? Your kitchen is beautiful!! I’m inspired! I’m just starting my remodel after 25 years in the home that my husband and I built. It’s time for a re do!! I love so many things about your kitchen and plan to use it as a blue print to give mine a face lift. I have one question, how deep is the window seat? I want to make a comfy place to relax, eat and read! Thanks!!! Hi – Thanks! The window seat is 20″ deep – I wouldn’t do any less than that. Make sure to build the back on a slight incline. (Which we did, but the window trim juts out over it so we’re not getting the full benefit.) Good luck! Appreciate the advice, and the quick response!! Our window bench has a back support piece as well – you just can’t see it behind the pillows. You know how most chairs have the back tipped out at a slight angle? (Not straight up at 90degrees) That’s what you’d want to do with banquette back as well. If that’s not possible, pillows can do the job. Hi Kelly – We have 9′ ceilings and the double French doors to the outside are 7′ tall x 58″ wide. We also have about 5″ of trim around all the doors and passages. Hi! Thanks for all your help so far. I was wondering if you could tell me how much space you have between your perimeter cabinets and your island? Right now our contractor is recommending 48 inches, but we’ve heard that might actually feel too wide. Also, what are the dimensions of your subway tiles in your backsplash? 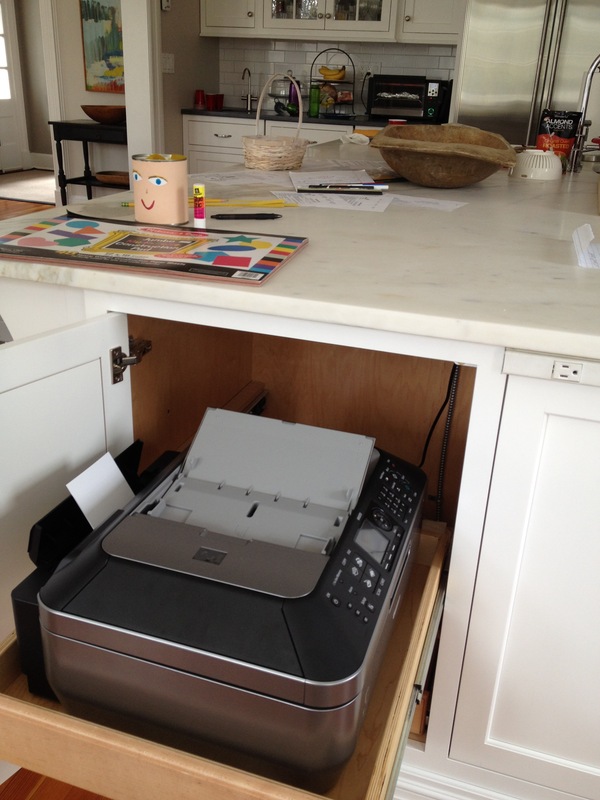 We have 45″ between island and perimeter cabinets. I wouldn’t want it any wider. The subway tiles are standard 3″x6″. Good luck. Would you still get the Bluestar if you could do it over again? Hmmm – not sure. There are a lot of things I really love about it, but some things I don’t. I think I would shop around and compare more than I did the first time. Can you share what you don’t like about it? I know you said the burners get really hot even on the lowest setting. Thank you! I love your kitchen and it is my inspiration for my current project. Amazingly my space is almost identical to yours so I can implement most of your fantastic design elements. Just want to thank you for being so generous with your time in answering so many questions. Your kitchen is gorgeous and I am so happy for you! Beautiful blog too. I love this kitchen. I have been to your site before to look at pictures and get ideas for our remodel. 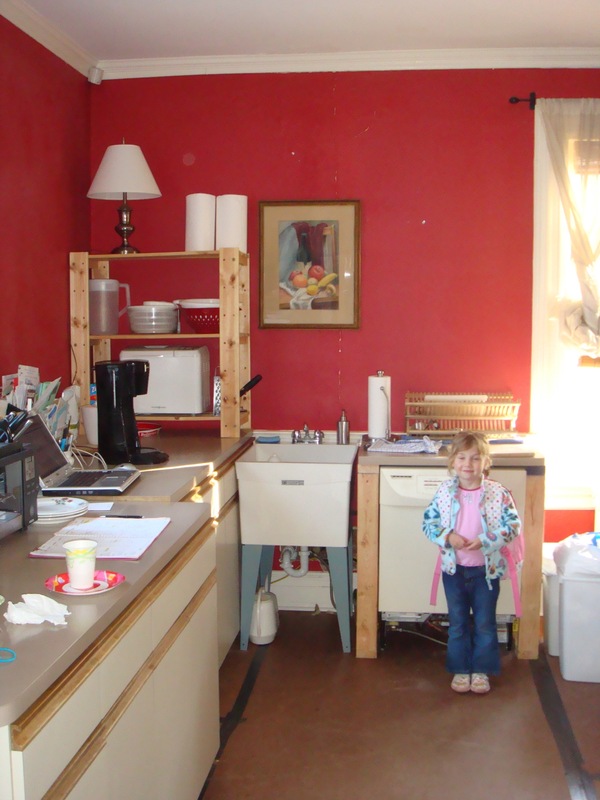 I once found a photo of the kitchen that stepped down into a family room area. Do you still have that photo on the site? I would love to show it to my husband. LOVE your recipes! Inspiring truly! Hi – thanks for your comments! Our kitchen is open to the family room — it’s all on the same level. There are some photos in the post titled “Open House Recap” that show people seated in the family room – maybe that’s what you saw? (Enter “Open House Recap” in the search box on the blog’s home page). Good luck with your remodel! Hi Kelly, The black slate tiles (natural cleft) are 12″x24″, from Mediterranean Tile. Good luck with your project! Hi, Sue it’s me again Kelly! I just picked up the Sunbrella antique taupe bench seat cushion and need to find some accent pillows that will work throughout the seasons and of course I like yours. I noticed the 2 lumbar pillows are grey and from IKEA. The two printed pillows are from restoration hardware and last where did you get the other pillows and do you remember the colors name by chance. Sue, would you mind sharing the source for the dining table light? It coordinates so well with the Haverhill pendants. Thank you! The chandelier came from a local lighting showroom that has since gone out of business (unfortunately). The brand is Preciosa, but the model has been discontinued. Thank you so much for getting back to me. What a shame. I love it. How do you like your Haverhill pendants? I’m getting them as well, partly because I loved yours so much! Am very happy with the Haverhill pendants! The bench cushion foam is 3″, and it’s wrapped in batting. The fabric is Sunbrella outdoor fabric in ribbed taupe. Good luck with your project! Hi sue, is your ceiling 9 feet? what is the height of your cabs and the height of your molding? Wondering if I can get your look being that My vent will have to go up and run along the top of cabs. Lastly did you have your Petra cardosa rubbed with mineral oil to make it darker? Thank you! Yes – ceilings are 9′. 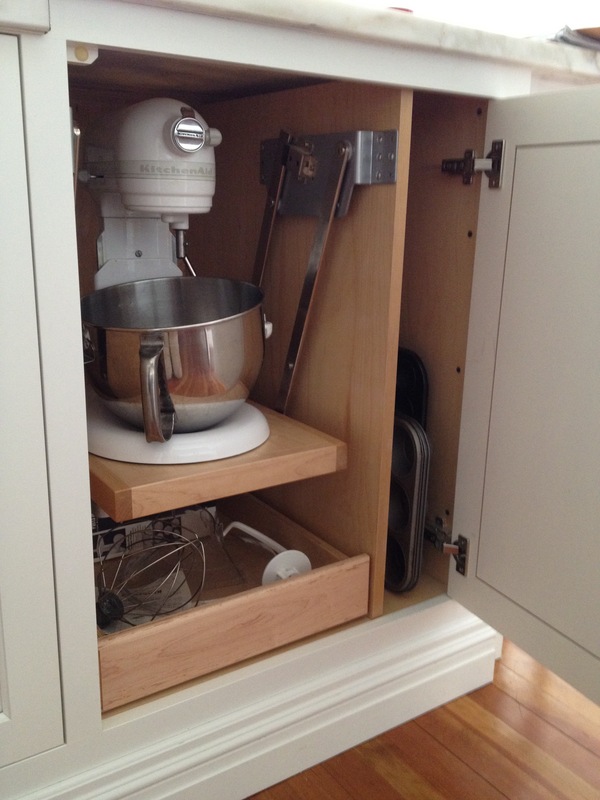 Cabinets only go up to about 8′ but look like they go to the ceiling b/c of fascia boards and compound moldings. (Maybe you could box in your vent in a similar manner?) Pietra was “enhanced” by stone fabricator to make darker (wasn’t mineral oil, though). Enjoy your new kitchen! Thank you for your quick reply. So yours is hidden in the same manner? Can you get access to the top of your vent and or motor if needed? Beautiful kitchen. Hi Sue! What a gorgeous kitchen! We are getting ready to build an addition to our home and I have been insistent on having a breakfast nook with a bay window in the new kitchen. Yours is exactly like what I was looking for! I found your kitchen through thekitchn.com. Can you tell me what the dimensions of your island are? And what the dimensions of the kitchen overall are? You wouldn’t be able to share the floor plan, would you? Thanks, Ann! We have really enjoyed our sunny breakfast nook. Our island is 5’x9′ and the kitchen is about 16’x 24′ (including the bay). Many of the details can be found on Houzz.com (search subeeskitchen) Sorry but we are not publishing detailed floor plans at this time. Good luck with your project! What do you use to clean your counters? We just, like 4 days ago, had our honed white Carrara marble counters put in and I am terrified to use anything other than warm water on a soft towel to clean them. I know at some point I’m going to need something more. Love the kitchen. We went for a similar look and I have your kitchen in my Houzz idea book. I was double checking my decision to go with subway tile by looking at your kitchen again. I’m all in. What color grout did you use on the subway tile? I only use dish soap (Joy lemon!) on the counters (and everywhere else in the kitchen). Also use the “no scratch” 3M sponges – even the gritty side doesn’t harm the surface. That said – you WILL eventually get some etch spots on the marble if you actually use the kitchen. The first one will freak you out, but after that you’ll come to embrace the patina. I love the look of 100-year-old, well-used marble. (FYI I did see the marble installers used acetone on the marble to remove some markings — didn’t hurt it at all. Good to know in case someone spills pink nail polish on the counters!) The subway tile grout color is Silverado. Enjoy your new kitchen! Hi Sue! It’s Ann! Would you mind telling me the dimensions of your breakfast banquette? I noticed the two ends are actually diagonal to make it a true bay (as opposed to at right angles). How wide is it at the widest point? And how narrow is the opposite side? Would you mind providing the depth as well? Thank you so much! Sorry to bother you! Gorgeous kitchen!! Hi Ann – The bay is 13′ at its widest and 10′ at the narrowest. The bench comes out 26″ from the wall, but is only 21″ deep. The difference is because of the inclined back. Hope this helps. What did you use for your trim paint in the kitchen and the rest of the house? Thank you sue. I am using your kitchen for inspiration and wanted to do bright white cabs like yourself but have been swayed due to oil based paints tendency to yellow. So now I’m going with bm white dove instead. Have you noticed any yellowing in your cabs or trim? Your kitchen is my all time favorite! I’ve admired your kitchen for awhile on houzz and just found your site! I’ve got 3 young boys and am gutting the kitchen in our new house. I wish I was brave enough to do marble. Can you tell me what your chandelier is over your banquette table? And what are the dark counters you have? Thank you! Thanks, Sarah! The chandelier over the table is a Preciosa brand, but the model has been discontinued. There are a number of similar glass /crystal models available on the market. I found this one at a lighting showroom. Our perimeter counters are Pietra di Cardosa – which is like a slate/marble combo. The stone fabricator treated it with something to darken it. Does your pietra di cardosa also etch? I’ve read differing opinions on it. Thank you! All I can say is…WOW!!!! Timeless, classic! My cabinet maker sprayed all the trim pieces and also installed them. The support corbels are about 5″ wide. Thanks so much for taking the time to answer not only my question, but ALL the questions. I’ve read them all & appreciate the information about your beautiful kitchen. I’m using it as guide for mine including the controversial marble counter. so generous about sharing your ideas. The kitchen and family room walls are painted Benjamin Moore’s Edgecomb Gray. 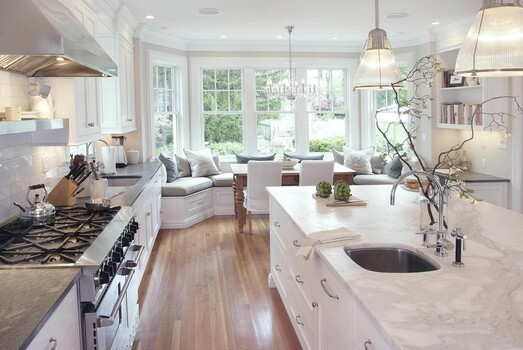 It’s nice with all the white cabinetry. What are the dimensions of the subway tile on the backsplash? Are they beveled or flat? The subway tiles are standard 3″x6″ flat. Basic basic basic! I feel like we are old friends. I love the industrial faucets. Can you please tell me who is the manufacture? LOL – the faucets are both Dornbracht “Tara” models, in chrome. After this, questions will be billed at my hourly rate! You definitely deserve a delicious lunch! Hello I have your kitchen in my Houzz Ideabook as my “favorite”. It is beautiful. I have been following your blog – yummy and interesting! You mentioned in an earlier answer that you installed a water and ice dispenser from Water Inc. We are planning a kitchen remodel and are considering doing the same. I have checked the Water Inc. website and can’t find a combination unit. Can you provide the maker and model of your ice/water dispenser. I would really appreciate it. Thank you for sharing your home and all your quick responses to the millions of questions! Hi Myra – Ours is not a combo water/ice unit — just chilled/filtered water. Next time I would add a separate ice machine next to the water chiller. Hi there- Would you mind sharing what flooring you used in your kitchen? Thanks so much! Hi – The flooring is fir, to match what was in the rest of the house. It’s stained in Puritan Pine. As a professional chef, I am loving this kitchen! Question about the baking sheet rack feature: how did you all accomplish this? I am looking at buying a commercial speed rack that holds half-sheet pans and trying to insert it into a cut-out in our island vs. having something custom made. Can you tell me what you all did and approximate cost? Hi Brigitte – I showed my cabinet maker (Darren Edsall Custom Woodworking) pictures of speed racks and he came up with this custom creation. A metal-working friend of his fabricated a stainless steel liner for the cabinet box, and also made the rails on which the rims of half-sheet pans rest/slide on. You could also make something using metal right-angle rails. Good luck! Hello – what brand hood is in your kitchen above the oven? I love it! 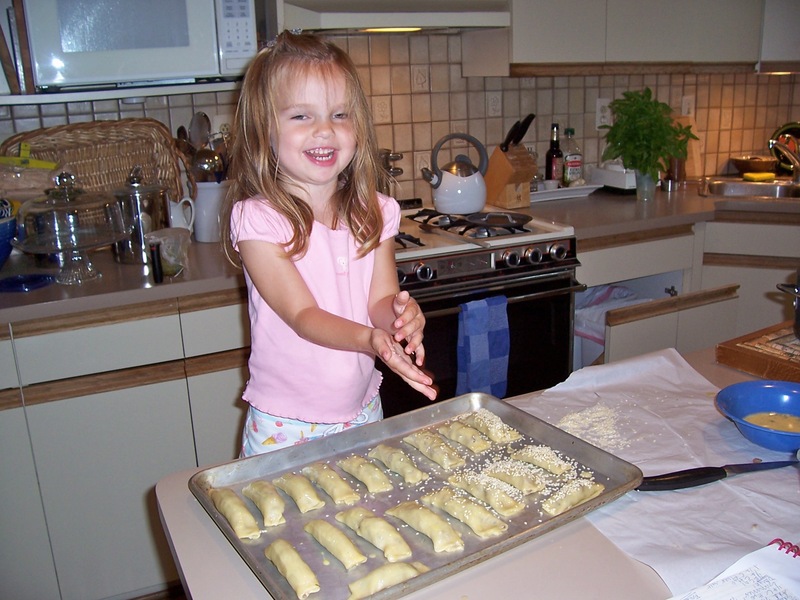 Hi Jamie – The range hood is a ProLine. Love the stainless baffle filters which can go right into the dishwasher for cleaning. Hi Sue, Do you recall the model number for the hood? I’m having trouble matching it to the Proline website and I want to make sure I’m ordering the right one. Thanks so much! Gorgeous kitchen-what brand of faucet did you use? It is hard to find ones with handles that come forward verses backwards. Do you like yours? Hi Colleen – These are Dornbracht faucets, and I love them! A worthwhile splurge. Hi Sue, Love your kitchen, just ordered the haverhill pendants for a beach condo redo. Would love to know the maker of the metal stools and where you found them. So sorry you had to leave that beautiful kitchen, but bet you will do one even better. Thanks for the words of encouragement! The stools are Emeco by Stark; we ordered ours through a designer for a slight discount, but they’re also available at Design Within Reach. PS I used large 200-watt bulbs for my 2 large pendants, and almost didn’t need any other lights in the room. I really love your kitchen and everything about your aesthetic! We are actively using your photos right now as the inspiration for our renovation. Our island is 16 feet long, so we have bought 3 of these pendants and I am just trying to figure out how many stools to buy and if you find these stools comfortable? Thanks for the compliment! Wow – I am envious of a 16ft long island. Maybe you’ve seen from my blog that we are currently planning a new kitchen (had to move!). One of the things I’m trying to decide is whether to keep the stools. I really like the look of them — clean and streamlined. However, they are not exactly comfortable! Very cold, any time of the year. I’ve thought about having custom cushions made for them. In your case, since you could fit a whole slew of stools (how many do you really need? ), going with something streamlined would definitely be the way to go. Anything too heavy or with tall backs would get too busy (IMHO). You could fit 8 of these stools on a 16′ island, or — you could have a bank of drawers on either side of the island (for placemats, napkins, etc) and then do 6 stools. Depends on how much seating you need and the design of the island. Hope this helps! Sue, I’ve been admiring your kitchen for awhile, now and am finally ready to make the plunge to remodel my own kitchen. Can I ask you the length of your range wall, not including the bay? Thanks — and good luck on your latest project (have you started, yet?)! Hi – Since I no longer live in that kitchen and the plans are still packed in a box somewhere, I’ll have to give you a ballpark. (Though I think the actual answer is on Houzz somewhere if you read through all the comments.) The range wall was a little over 20′ long; the island was 9′ long; the range was 48″, with 30″ counter on either side; the wall oven/microwave column was 30″. Hope this helps. Good luck with your project. My new one is in the planning phase – the hardest yet most important part! Thanks so much for your response! I looked through all of the comments and was trying to do some math (end cab plus aisle plus island….) to get a good approximation. I have a little over 18′ to work with (and 17 schematics from my architect) and I already have remodel fatigue — I don’t know if I’m going to ever get to breaking ground! 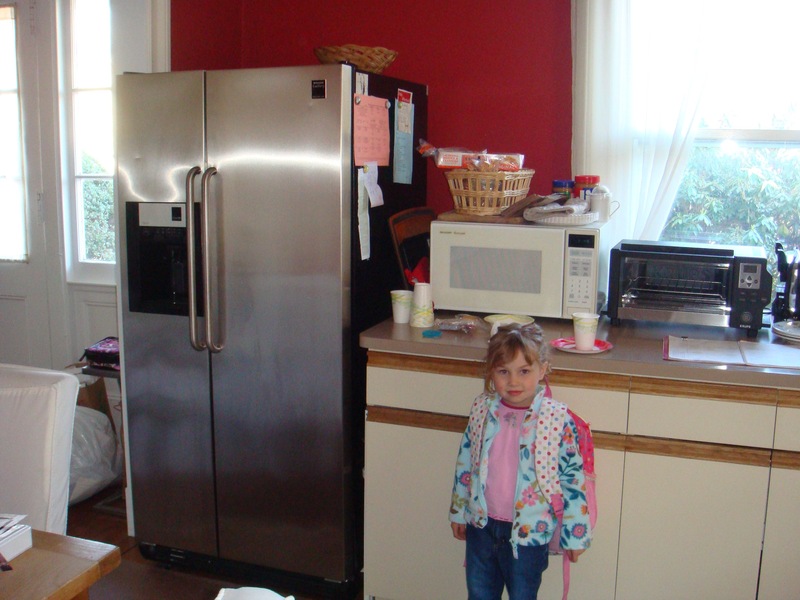 Did you ever find that having your fridge far from your nook or main sink was problematic? And was a prep sink really useful in your plan? The fridge was only two steps to the right from where I did all my prep (on the island). It was also handy to be able to unload things from the fridge onto the island. Prep sink was key! Just make sure it’s big enough to be functional and outfit it with a disposer. So, you only used your main sink area for clean up … not for prepping. Was your dishwasher between your range and sink, then? Right – clean-up only. Dishwasher was just to the right of the clean-up sink (with a panel to hide it). To the left of the sink was a garbage pull-out; also had a garbage and recycling pull-out on the island, to the right of the prep sink. Do you have any close ups of your moulding build-up above the cabinets? We like that it does not project too far into the room and yet it still detailed. Custom milled or stock from a moulding supplier? 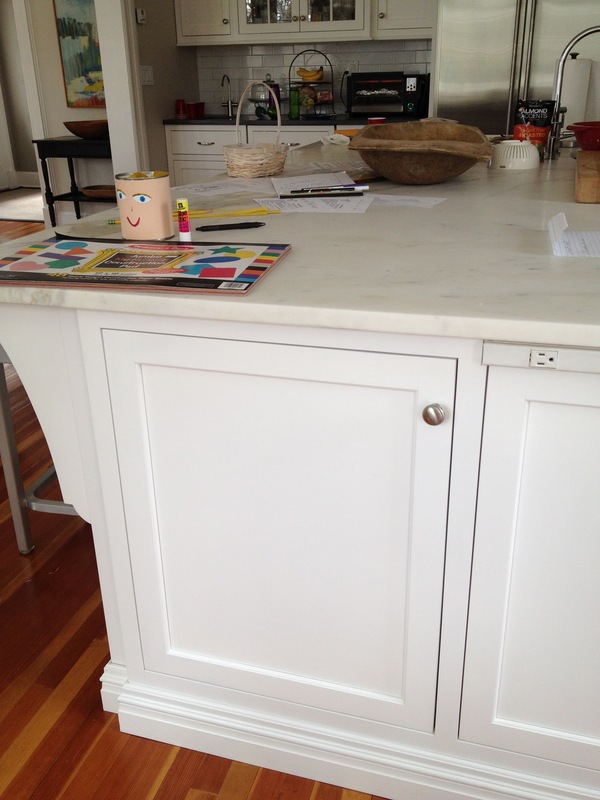 Hi – The crown in this kitchen is a custom combination of stock mouldings. There’s a photo on Houzz of the bar area, which might show the detail better. I know you have already answered a ton of questions regarding your lovely kitchen,but I am hoping you will be willing to answer one more. Where did you get the slipcovered chairs? I know that these are easy to find but the scale and style of your chair is perfect for my table. These are Restoration Hardware chairs from at least 10 years ago. I had the slipcovers made out of Sunbrella fabric. Absolutely love your kitchen and trying best to replicate. Which hood/brand do you have? I have a Wolf stove going in and your picture is stumping my appliance guys. Lastly do recall where the pendants are from? The hood shown here is a Prestige ProLine. (We had a remote blower in the attic to minimize noise in the kitchen/family room.) The pendants over the island are large Haverhills from Hudson Valley Lighting. This is a beautiful kitchen. Could you please provide me with the name of the paint color that you used on your kitchen cabinets. Thank you. Thank you. The wall color is Benjamin Moore’s Edgecomb Gray, and the custom cabinets are the same shade of white as Benjamin Moore’s Impervo (oil) white (used on trim throughout). Keep in mind that the Edgecomb Gray will look different in every room, depending on the amount of natural light. This kitchen had a lot of natural light; in darker rooms it will take on more of a greenish (?) tint. Thank you so much. I have chosen Torquay cambria quartz countertops and my cabinetmaker needs to know what white to paint the cabinets to go with it. There are so many whites that it is mind boggling. I will get a sample of the BM impervo white to see if it works. Do you know where the lights over your island came from in your white kitchen? I know this is an older post but I’m in love with them! I loved them too! The pendants are Hudson Valley’s “Haverhill”. They could take a 200-watt bulb, so were very functional. Could you please tell me the name of the edge that you used on your countertops and island? Hi – It was a flat/barely eased edge. Could you please tell me where you purchased your kitchen table.? 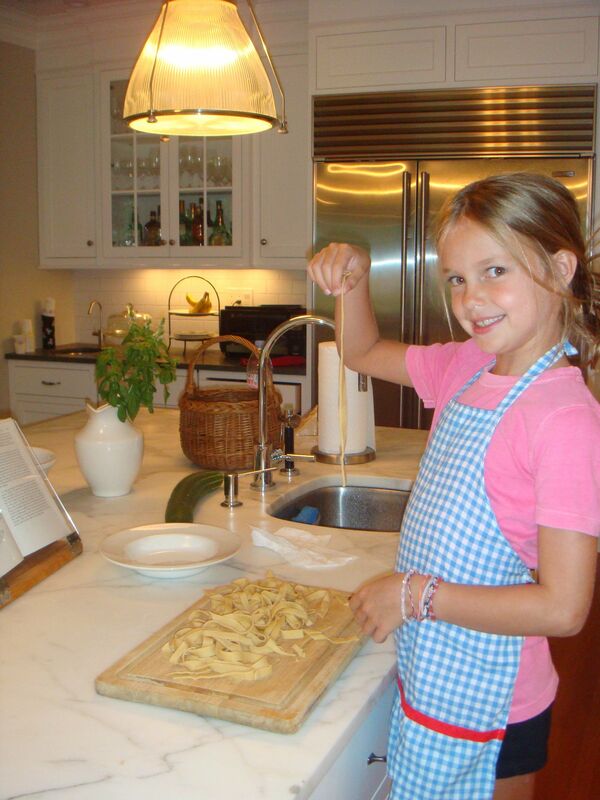 Thanks for responding to my questions even though you are no longer in this beautiful kitchen! Could you please tell me where you purchased the kitchen table? We just built a new home with pietra cardosa on the perimeter. Could you share how yours were sealed? Our fabricator did not seall them, and we did with DuPont bullet proof but are still getting oil stains. We cook a lot on a professional capital range. We have heard miracle 511 impregnator may be better but will turn the color more to black. Would have to strip and reseal. I would appreciate any advice or what your experience was. We have put pietra cardosa on our perimeters. It was not sealed by the fabricator and we immediately got oil stains (from a paper towel holder from our old house). We have since remove the stains and sealed several times with DuPont bullet proof sealer. We got stains again from oil spattering. We have a 48″ capital with open burners – love to cook. Can you share your experience with pietra? What did you seal it with, did it stain from oil? We have heard Miracle 511 impregnator may be better to use but it will turn the pietra black. We would have to strip the counters and start over. We have sealed another couple of times with bulletproof, to give it another shot before taking this step. Our pietra was sealed with a color-enhancing sealer by the fabricator prior to installation. (I wanted the darker gray vs natural pietra.) After that, I stocked up on 511 sealer but don’t think I sealed the counters once in 3 years. There may have been some oil stains near the range, but the darker color and variation in the stone made it hard to tell. Good luck with whatever way you decide to go. Did you typically get water spots that left over time? I can live with the water spots that dissipate, but if you didn’t have that experience with the enhancer I would be tempted to strip and reseal with miracle 511 enhancer and sealer. I didn’t get any water spots, even around the sink. However, if I were you I would get a second opinion from another (reputable) stone fabricator. The enhancer will darken the stone, and you may still get oil staining (though it will be less noticeable). Different people have different tolerances for stains/etching/etc. — it’s very personal. I know the first few etchings on my marble island and oil darkening around the range freaked me out, but then I got over it and learned to embrace the patina that you get from a working kitchen. Can you please tell me if the white Impervo oil paint that you used on your trim is low luster? Yes – I always use Satin Impervo white, low luster. It’s classic and very durable. A couple years down the line from your beautiful kitchen being redone and I wanted to ask what are your thoughts on the marble now. I ask since I am looking to copy your kitchen however our range is in the island where the marble will be. Is this a bad idea from someone who has lived and used their kitchen? I understand that your stove is not on the marble side but any insight? Any response would be greatly appreciated from someone who has been going over this for the past 8 months and now needs to make a decision. This is a well-timed question, since I’m in the process of finalizing the design of our new kitchen. (We had to move in 2014.) I will be blogging about the process and decisions such as this. I am still a huge marble fan; nothing else has the same old-world look or feel. And, for the new kitchen I think I’m going to go with the same material for all counters (vs a separate one for the island like last time.) So for me the big issue is the same one you’re facing — do I want to have white marble next to the range? I’m leaning towards “Yes” — either carrara or calacatta gold. Not even hot spaghetti sauce stains immediately; marble is a rock, not a piece of chalk. That said, you wouldn’t want to leave a sauce-coated spoon sitting on the counter overnight. I’m sure most kitchen designers would recommend a quartz product instead of marble in your case, but you need to trust your gut. Good luck with your project! Hi Sue! I’m copying your beautiful kitchen. Would you mind telling me the color grout you used for the subway tile backsplash? Thank you! Hi and thank you! The grout color in this kitchen was called “Silverado” — it was kind of a taupe/light mushroom. We had to move 2 years ago so I am now in the process of designing a new kitchen. Details to follow on the blog! Good luck with your project. Thank you! Looking forward to your next project! I know this post is super old but your kitchen is still my FAVORITE! Hopefully, you see this;)! We are embarking on a kitchen Reno/addition and I want to make sure we add enough space but not too much! Would you share the dimensions of your kitchen including your breakfast nook! Is there anything you would change or do differently? Thank so much for your time! Hi Leesa – Thanks for the note. Guess what? We’re re-doing another kitchen as well! We had to move in 2014. The old kitchen (shown here) was about 16′ wide by 23′ long, including the banquette area. The island was 9′ x 5′. I’ll be blogging about the new kitchen project, which will be starting very soon. Many elements will be the same, but some different. It’s a different space, with different light, etc. The last kitchen was all new construction, so in many ways much easier! Working with existing space is much more challenging. I’m still doing marble counters, a large gas range, and as big of an island as I could fit. Check back to see the progress! Good luck with your project. Hi there. I absolutely love your kitchen! I was wondering where you got your barstools from? Hi Karen – You can find these Emeco counter stools at Design Within Reach. Hello there. I am absolutely in love with your kitchen! I was wondering where you got your stools from?